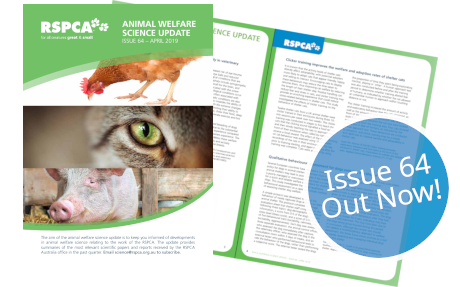 Every quarter, RSPCA Australia’s science team produces the Animal Welfare Science Update. The aim of the publication is to raise awareness of recent developments in animal welfare science that relate to the work of the RSPCA. The Animal Welfare Science Update provides plain English summaries of the most relevant and interesting scientific papers and reports on animal welfare published in the previous few months.